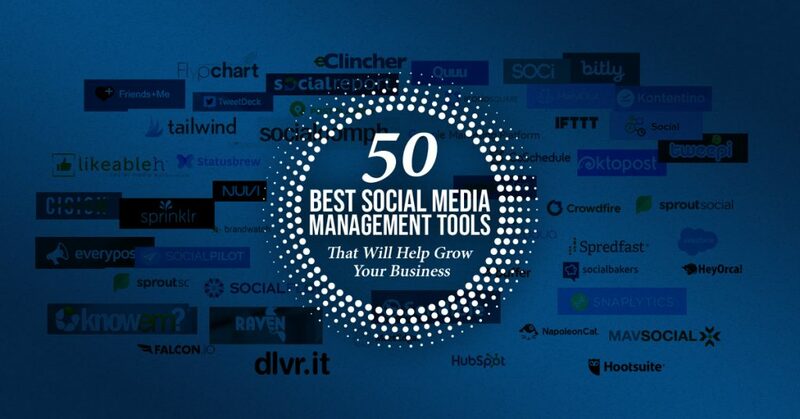 Today we are going to discuss the 50 Best Social Media Management Tools That Will Help Grow Your Business. Just like the offline marketing, online marketing is super important as we are living in a digital world where technology is taking over everything. Social media is one of the most important tools to use with your digital marketing campaign. The way you can reach out to your customers is innumerable in this technological day and age, and harnessing the power of these platforms can only expand the way that you do business. However, being in control of these platforms is different than actually having them. You may sometimes find yourself getting lost in the overwhelming mess of the social media accounts you have, and how often you need to be present on them to make sure your message is getting across. Luckily, with this surge of social media becoming so prominent in digital marketing, there is a multitude of ways to manage all of your social media accounts. To make things even better, we’ve compiled that list for you. That’s right! We’ve got 50 of the best social media management tools you can use to keep all of your accounts lined up, your presence consistent, and your message clear. Let’s get started! Arguably the most popular, and certainly one of the best social media management tools, is HootSuite. It has an easily accessible interface allows it to fit any workplace environment, and its compatibility with over 35 different social media platforms—such as Facebook, Google, and Twitter—makes it an easy, one-stop shop for all your scheduling needs. You can queue posts to different platforms when you won’t be around, or you can curate and create content at your whim. HootSuite also keeps you in the loop in regards to important topics of conversation, as well as analytics on what you’ve currently got going. Make sure to check out their packages to see which one fits your business model! Another all in one stop for your digital marketing needs, HubSpot gives its fan base of over 18,000 customers a chance to turn their outbound marketing (like cold calls, and cold emails), into fully fledged leads, giving them an all-in-one for lead generating and inbound marketing. Additionally, HubSpot allows its users to combine the power of blogging, social media management and curation, email marketing, and analytics in an easy to use and extremely accessible interface to keep you on top of your digital marketing. Check out what they can do for you! One of the biggest parts of social media marketing revolves around consistency, and one of the best social media management tools to ensure that you’re on time for your posts is MeetEdgar! A software that allows you to not only queue your posts ahead of time but also to bulk-post across platforms, MeetEdgar makes the act of posting to social media a breeze. Additionally, when Edgar runs out of fresh content to post, it’ll recycle what you’ve already created! This ensures that relevant content is still fresh in everyone’s mind, as well as making sure that your presence doesn’t disappear without your consent. Check out what Edgar can do for you! One of the most popular social media platforms for marketing is Twitter, and with how quickly news can move, being able to keep up is important for those who keep a keen eye on hashtags. That’s what TweetDeck is for; a one-stop shop for all of your Twitter needs! You can send a tweet, send a direct message, engage with other posts, and view other profiles all from the same window! Additionally, you can link up more than one account, giving you a chance to keep eyes on all of your Twitter-related needs. IFTTT, or better know as “If This, Then That,” is a smart and successful way to ensure that your applications are operating as quickly and efficiently as they can. Though it’s meant to be easy for us to use, technology doesn’t always run as intended. IFTTT is here to make sure that things are running smoothly, and that your applications are cooperating together. By pairing simple functions with various social media platforms, IFTTT makes the act of using social media as easy as pressing a button. For instance, you can ensure that you never tweet a link of a picture instead of the actual picture instead, all using IFTTT’s easy interface! Make sure to check it out and see why they’re one of the best social media management tools. A personal favorite of mine, ManyChat allows you to use the power of Facebook messenger to connect more personally with your potential clients! By adding a simple pop-up to your page, people browsing your website have the ability to message you directly using ManyChat, giving you a chance to be involved in the process of a sale. The personal touch also helps you to build strong connections with your customers, and to start a business relationship that makes the connection last! Trusted and used by many, Buffer is one of the best social media management tools that a business could be used in this day and age. By allowing its users to manage all of their social media accounts from one simple dashboard, Buffer makes it easy to keep in touch with things like your Facebook page, your Pinterest, and your Instagram! By making it easy to maintain a sense of consistency across all of your accounts, you can build a strong and steady audience of people who will generate the inbound traffic you’re looking for. Additionally, you can schedule your posts ahead of time, and analyze how well those posts did once they’ve been shared! Part of being one of the best social media management tools is efficiency in getting started quickly, and SproutSocial promises to get you and your team up and running in minutes! With no requirement for up-front payment, SproutSocial gives you all the benefits of managing your own social media platforms with ease without the worry of shelling out what you can’t afford. You can use SproutSocial from your mobile device, and through your web browser, and it’s easy to use interface makes managing your social media posts easier than ever! Stockpile great content for different accounts, oversee how people are interacting with what you’ve published, and stay on top of your social media presence. You know them, and if you aren’t using them, you should be! Google’s freemium version of analytics is one of the best ways to keep on top of your posts, and how well they’re doing with their intended audiences. By keeping you in the loop on what your customers are looking for in the content that you share and curate across social media accounts, you can better cater to them with the things you’re writing! Make sure you check out just how much Google can offer you with their marketing software. Being on top of your SEO game is important when it comes to digital marketing, and Raven allows you that control with their easy to use software! Analyze your SEO results, identify and follow through on potential backlink sources, and combine these amazing tools with your social media accounts in order to see what’s working for you, and your business! That’s right—Raven can connect to your Google Analytics and your Facebook, among a few, to give you the feedback on how your organic growth is doing with the content you’re sharing, writing, and providing for your audience. Find out more about what Raven can do for you! An important part of social media is being able to monetize the content that you create, enabling the path for you to make a profit in the process. That’s where SocialFlow, one of the best social media management tools, comes in handy. By allowing you to share the content you create while providing you with monetization options, SocialFlow puts you ahead of the rest! By harnessing the power of social media to share content that’s relevant, educational, and important for your business and your audience to know, you’re building a strong foundation that allows you to branch out further. SocialFlow is an integral part of that process, and there’s a large chance that content you see streamed through your Facebook timeline is a product of SocialFlow! 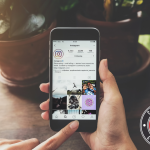 Instagram is one of the most popular up and coming social media platforms to use for your digital marketing, and Iconosquare is a wonderful tool to use when building up that Instagram presence! Iconosquare allows you to queue your posts in advance, whether they’re being posted directly to your newsfeed, or to your Instagram story, or maybe both! Additionally, Iconosquare gives you a direct link to your follower growth, showing you when people tune into your account, and what posts brought them there! Being in contact with your customers and clients is crucial in terms of running a successful business, and Sprinklr is one of the best social media management tools to use in order to build that connection and maintain a consistent relationship with the people who matter the most—the consumer. By connecting to a variety of social media platforms—Facebook, Twitter, and LinkedIn to name a few—Sprinklr gives the business owner a singular place to interact with their customers in order to deliver what they describe as amazing customer experiences. Make sure you check out how they can help you in digital marketing, ad campaigns, and more! With how expansive the internet can be, making sure that you have your own unique domain is important to the power of starting and curating your own brand. KnowEm gives you the edge up in making sure that you truly are one of a kind, and that you are safe and protected within the domain that you choose. By giving you the option to search across every type of social media platform there is, KnowEm shows you what domain names are already taken, how to create your own, and the right name for your brand, and your business. Creating accounts for social media is one thing, but making sure that you’re doing everything you can to maximize your results with those platforms is another mountain to climb. Introducing SocialOomph, one of the best social media management tools to use when building your presence across social media! SocialOomph provides you with a litany of free and premium tools to use, including scheduled tweets, tracking of important keywords to stay on top of the ever-changing game, and creating RSS feeds from social updates! By taking control of your blogs, email marketing, and all social media accounts in one location, you can stay on top of everything that requires your social media marketing attention. Friends+Me is another amazing way to connect all of your social media accounts on to one platform. By allowing you to pick and choose which content to share to what platform, Friends+Me gives you control over what content suits which audience, making it one of the best social media management tools you can use. Additionally, you can use it on the go! Friends+Me has a friendly mobile interface that allows you to post, share, and save certain content for later use on whichever platform you think is suited best. With additional SEO tools to check how well the content is doing, Friends+Me gives you an amazing overall experience. By allowing you to combine many social media platforms in one place, SocialPilot aims to be your new one-stop shop for scheduled posting, bulk replies, and analytics across the social media atmosphere! One of the best social media management tools, SocialPilot allows you to curate content from one location, with the possibility of sharing up to 500 posts per account. In addition, you can build up a team of up to 20 members, allowing your marketing campaign to expand and build up across a multitude of specified sections! One of the most important aspects of sharing content with your audience is encouraging them to engage with a call to action, and Zoho Social makes that engagement process easier than ever. Not only can you post across multiple social media accounts, instant notifications let you know when people are interacting and what they’re saying about you! Choose between creating your own reports, or ready-made reports, to understand where your content is falling with your audience and what things you should specifically tweak in order to gain the most valuable results. Sometimes, our jobs require us to manage social media for other clients, and knowing the best way to handle their accounts and get them set up for success is imperative to make sure they’re satisfied. Sendible is without a doubt one of the best social media management tools that agencies can use to make sure their clients’ social media accounts are running the way they should be. By allowing your team to come on board, Sendible gives you the power to make sure that your clients’ experiences are nothing less than sublime. Combining engagement, scheduled publishing, and effective traffic and leads generation from reports, Sendible can make your life—and the life of your clients—much easier to manage. By connecting you with the most popular social media platforms that work for your social media marketing, AgoraPulse gives you an easy to use dashboard that allows you to interact with those social media accounts with ease! Offering things like mass replies—where the various messages and notifications you can get from a variety of different social media can flow into one place, allowing you the ease to respond as quickly as possible—AgoraPulse is easily one of the best social media management tools, and something that every business owner should be using in their day to day marketing lives. Making sure that you’re in control of your accounts is important, and eClincher offers you another great place to combine all of your social media endeavors into one convenient place! Keep track of things like your posts, the content you’re creating, and the traffic and growth you receive from customer interactions! Additionally, eClincher offers you suggested content, as well as influencers discovery. This keeps you on top of your game, and ahead of your competition when it comes to interactions, and building your brand. Ad campaigns are integral when it comes to digital marketing and gaining a strong and dedicated audience. Having the right space to plan said ad campaign can make your life as a digital marketer easier, and that’s where MavSocial comes in. By allowing you to have a place where you can bulk upload all of your images and keep them in a viewable library, sharing content and creating advertisements around photos of your business and services has never been easier. Make sure you take a look at what MavSocial, one of the best social media management tools, can do for your business. A lot of social media platforms that are the best for marketing are the ones that are still up-and-coming on the digital marketing scene. Instagram, for example, is a powerful juggernaut that everyone should be using, as well as Pinterest. TailWind lets you combine those two powerful forces into one space, making it one of the best social media management tools that you can use in 2018! Queueing posts ahead of time, keeping on top of conversations between customers and comments towards the business itself, and measuring your results to stay on top of the game are just a few things that TailWind can do for you. The best part? How affordable it is! There’s a lot of fantastic social media management tools already listed here, but FlypChart is different from the rest. FlypChart is a software that you can combine with other social media management tools, making it an important part of your overall social media marketing experience! FlypChart provides you with a calendar of all of your scheduled posts, as well as the people involved with making sure those posts go live, and the content that’s involved with those posts. Additionally, you can categorize the content you make, and where you’d like it published! The most important part of social media marketing is the content that you share, and the information you give to your audience and your customers. Making sure that the right content is shared in the right places, however, can be a little hard to manage with so many social media platforms to take charge of. Quuu makes that problem disappear, making it one of the best social media management tools you can be using. By letting you hand curate every piece of content that you produce—as well as providing suggestions for future content—Quuu makes sure that you’re on par with what your target audience wants to see, and how you can make sure to maintain that relationship with social media outreach! Being able to connect all of your most important social media accounts in one place makes the idea of social media management a lot less intimidating. Dlvr.it is among the best social media management tools that make your job of keeping tabs on your accounts easy and efficient! On top of being able to post bulk to the most important platforms you’re securing—like Facebook and Twitter—Dlvr.it also recycles your old social media posts into new content! That way, you’re maintaining an air of consistency, as well as fresh content from information that your audience can still find valuable and educational. What we post on social media is important, as it shows our audience what our brand and our business is all about. It’s also meant to engage and made prospective clients want to see what we can offer them. EveryPost is one of the best social media management tools you can use when attempting to publish and create this amazing content. With bulk posting options to share your message across a variety of social media platforms, EveryPost also lets you customize what you’re saying in order to suit the needs of the audience who will read it. Forget about character limits with EveryPost—speak to your heart’s content! The power of social media burns from the amount of content you can share with a simple click, and driving traffic towards your websites through links and curated content is the overall goal when it comes to traffic and leads. Bitly Enterprise is an integral part of that link sharing process by providing you with customized links for your content! Your brand is important, and Bitly Enterprise is here to make sure that your links reflect your brand and drive maximum traffic back to your website with concise keywords. Additionally, these results file in one collective dashboard, making it easy to watch your growth and progress as it builds! When starting with social media marketing, a lot of people can wonder about the Return on Investment, or ROI, on what you’re producing. Oktopost is one of the best social media management tools to use when you need to bridge the gap between the content you’re curating and the lead generation that comes from it! By being able to track your newly generated sales to the initial social media post where the traffic and process came from, Oktopost makes it extremely easy to understand what messages are selling, and where they’re selling from! Twitter can be a tricky place to try and find leads based solely on the use of hashtags and a general common interest. Luckily, Tweepi is combining the power of social media with the growing trend of artificial intelligence, giving you a strong base for your leads and the followers who’re the most willing to engage! With Tweepi, you can track certain hashtags to see the users that are engaging with those topics. From there, Tweepi’s AI can tell you which users would be the most viable for your business, and by connecting you with them, you can gain followers and potential customers faster, and with more ease! Manual labor and sometimes meaningless tasks can get in the way of productivity. Creating content that’s made for social media can seem arbitrary when the amount of time it takes to get there doesn’t seem worth it. That’s where Azuqua comes in. After taking in the faction of Socedo—one of the best social media management tools used to grow your Twitter base and grow the traffic that drives back to your website—Azuqua has become a one-stop shop for maintaining a social media presence with automation that saves you time to get your work done! Advertised as the #1 marketing calendar that you can use for your business, CoSchedule allows you and your team to collaborate in one convenient place for all of your business and social media marketing related needs! With easy tools like drag and drop functions, auto-publishing content to a variety of social media platforms, and reusable templates, CoSchedule can be your new one-stop shop for everything your business needs to timeline and document your day to day lives. Spreadsheets are a thing of the past with CoSchedule! Part of being a competitor when it comes to social media marketing is using the power of public advertisement to see what your competition is doing. From there, you can formulate your own plan in order to outsell and become the best in your league! That’s where Crowdfire, one of the best social media management tools, comes in handy. Crowdfire keeps you on top of your social media game by making sure that your Twitter account is up to date by unfollowing inactive accounts, and checking in on your competitor’s followers to see what they’re generating. Additionally, Crowdfire can suggest relevant content based on your initial topics of interest, as well as content you’ve previously shared! With the idea of scheduled posts so heavily prominent with social media marketing, you want to make sure that the posts you’re writing are posts that will speak and connect with your audience. Post Planner not only lets you queue your content over a period of time, but their recommendation engine analyzes a slew of top performing content to see what will work for you and your business! The content that you queue to post across whatever social media platforms you choose can be easily edited from one location, making it simple for you to switch things around last minute if need be! By combining the wonderful and collaborative idea of a digital calendar with the intuitive promise of creating original content to post across a slew of social media platforms, Falcon is one of the best social media management tools to make your overall social media marketing experience better! With the ability to create organic and paid-for posts in one place, Falcon provides a sense of digital community that allows your team to respond and react to the content you’ve created before you’ve posted it! With additional features to check on analytics regarding how your content is doing with your audience, Falcon is truly unique in its social media marketing approach. Being able to tap into the power of the conversations that our customers are having about our business can seem tricky, but Salesforce Social Studio gives us that power. By analyzing what people are saying about us, we can form our brand to be a little more specific in what our audience is looking for, and what we can offer them to keep their interest! With the number of social media platforms we use to make sure our digital marketing is on the right track, Salesforce Social Studio makes it easier to interact with each of them. It gives you one dashboard to watch these conversations as they take place. Building better content starts with listening to your audience. When you’re planning a nationwide ad campaign, having to understand and shape your content to fit a wide variety of people can seem intimidating. Spredfast makes it easier for you to manage this social content on a broad scale, giving your team an easy-to-use interface that makes it one of the best social media management tools of 2018. By being able to build a foundation of trust with every interaction you create with your audience, Spredfast is a durable software to use when starting your marketing journey. It provides you with care in every aspect—customer service, analytics, and control of your social media accounts that makes you truly in charge of everything that happens at your business. The best social media management tools should be able to not only give you the chance to stagger the content you write but to also be able to suggest more content when what you’ve written has run its course. Likeable Hub gives you a place to not only queue up the things you create but also suggests more content for the future! You can also listen in on what people are saying and how they’re responding, giving you a chance to adjust as needed in order to reach your audience in the best way possible. Your team will flourish with a very usable interface and the multitude of options that Likeable Hub can offer you. Once you release your content into the social sphere, watching people react to it can be intimidating and nerve-wracking. With the power of NUVI, however, you can relax and let the process unfold exactly how you’d like it to. NUVI allows you to track analytics in real time, giving you a chance to watch the way the conversation flows once you’ve posted your content. If things need tweaking, you can edit immediately and even influence behavior in the conversation if necessary! Snapchat and Instagram are two of the main social media platforms that are growing in the marketing scene. It’s mostly due, in part, to the way that “stories” play into their interface. They provide people with images that only appear for 24 hours before disappearing. Snaplytics is one of the best social media management tools you can use to keep up with the things you’re sharing to both Snapchat and Instagram. By automating your posts, giving you easy to read insights that make managing your content easier than ever before, and a comparable system for ROI, Snaplytics keeps you on top of your Snapchat and Instagram game. Building your brand is an important part of digital marketing, and Brandwatch is one of the best social media management tools to get your brand and your name out there. By keeping tabs on analytics in real time in relation to your brand, and people mentioning your brand by name, you can build your content around the conversations that people are having! Additionally, when it comes to the topic of your brand and your services, you can keep on top of the things people talk about the most and find educational ways to bring those topics to the forefront of the conversation in the content you create! By combining with the powerful Sprout Social, Simply Measured can offer you the best of the best when it comes to social media-driven analytics! With access to deep social listening that keeps you in touch all conversations that surround your business, you can keep your content up to date when it comes to what your audience is looking for. Combining this powerful social analytics with the management that Sprout Social can offer you overall, Simply Measured can make sure that you’re getting the information you need when your content hits the technological highway. Regardless of the size of your business, you need the best social media management tools to make sure that you’re building your social media marketing presence in the most efficient way possible. By bridging the gap between you– the business owner, and your customers, Statusbrew gives you all of the best social media facets in one easy to use interface. With the power of connecting your most important social media accounts in one place, you can stockpile content to post over a certain period of time. It can manage PR campaigns across multiple social media platforms, and its significant automation makes it easy to maintain and connect with potential leads! Being able to manage your own social media accounts is a separate task than handling the accounts of your clients. Luckily, HeyOrca is here to make that job easy for both you and your respective prospects! You can present social media content to your clients without the hassle or the wait. Additionally, every client you receive with HeyOrca receives their own personalized calendar, where you can organize their social media clips and content without worry or fear of clogging and mess. The use of artificial intelligence is slowly but surely making its way into the digital marketing scene, and social media marketing can truly benefit from a touch of automation. Socialbakers uses the power behind AI to create customer personas for you and gives you an idea of who to target when curating your social media content! After you’ve got an idea of who you should be targeting with your campaigns, Socialbakers can measure how effective said content is across the board, giving you quick and easy results on what people are saying and how you’re doing in comparison! Having one place for all of your social media marketing needs is what being one of the best social media management tools is all about. Social Report glows with overwhelmingly positive reviews about their easy to use interface and their sophisticated approach to managing your important social media accounts in one place. Analytics show you which social media platforms are performing well with the content you’re creating, and which ones are falling to the side. By comparing across the board, you can more easily fine-tune content on each account in one place, making it easier to manage from one location! Being able to easily connect with every member of your team makes social media marketing easier, point blank. By saving time with the approvals needed from all sides of the table, Kontentino connects you to your team in a fast and efficient way, making it one of the best social media marketing tools you can be using. All of the posts you have scheduled for your social media accounts are lined up in one place, making the edit and review process easier than ever. Additionally, the drag and drop feature makes rescheduling as simple as one click! Publishing on the most important social media platforms as quickly as possible makes social media marketing a breeze. NapoleonCat is a unique way to keep all of these platforms together, making your job as a business owner simpler with the way you can engage with your clients, and with your team. Planning your content is easy with a calendar that both clients and coworkers can use and see. The middleman is no more when everyone is on the same page! You can reply to customers and questions in real time via private message as your publishing new and exciting content, keeping you in the middle of the action. Planning your campaign is an important step when it comes to digital and social media marketing. One of the best social media management tools revolves around maintaining a constant stream of communication between yourself, and your clients. That’s where Cison comes in. By monitoring your full reach on social media, comparing analytics within your own system, and managing a database full of the best influencers for your brand, Cison connects you with the most powerful people that can drive business towards your brand with ease and success. Taking in key aspects of what can make social media marketing a hassle makes for a better overall experience once these issues are addressed. SOCi prides itself on pinpointing the things that make social media marketing too much to handle and fixing them with their innovative and easy to use dashboard design. With SOCi, you can check in at any business location, regardless of where you currently are. By addressing the social media workflow challenges that people can face, SOCi has made the process of social media marketing that much easier, and that’s what makes it one of the best social media management tools you can be using. And… that’s all she wrote! We know, there are so many different options out there that can help you with your social media management. 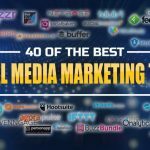 However, I truly believe that these 50 are among the best social media management tools, and each one can offer you something different and make your digital marketing career just that much easier. See which prices work the best for you, collaborate with some amazing ideas, and get your social media marketing campaign up and running! We talked about a lot of Social Media Management Tools. 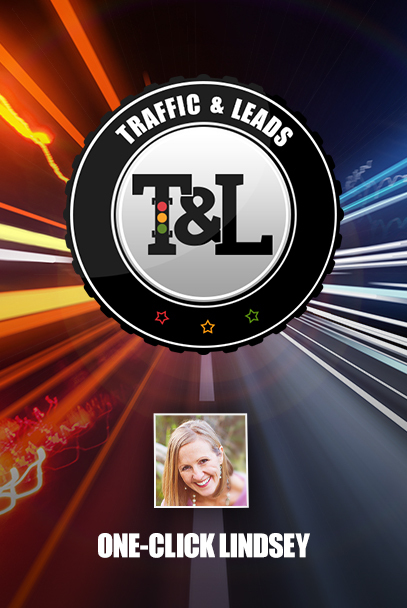 So you might be interested in knowing some of the best digital marketing experts on the web.